Previously unheard of phenomena happening now in Australia on a monthly basis? Many people who suffered from 'thunderstorm asthma' had never had an attack before. 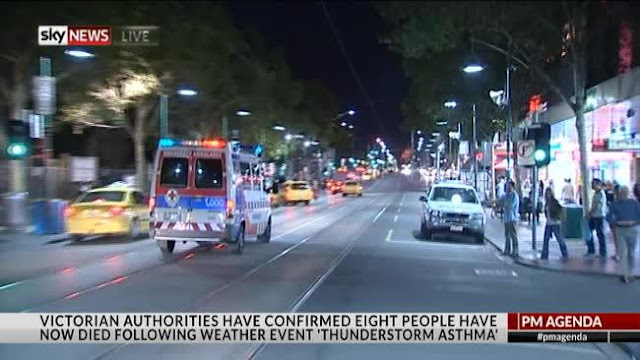 "Thunderstorm asthma" that struck Melbourne a fortnight ago killing eight people is set to hit Victoria again on Sunday night. The Bureau of Meteorology is forecasting a storm Sunday night, with experts warning of breathing problems for asthma and hay fever sufferers in Melbourne. The world's worst recorded thunderstorm asthma attack claimed eight lives and saw more than 8500 hospitalised in Victoria last month. The National Asthma Council Australia said expected thunderstorm conditions combined with high pollen counts can lead to breathing problems for people with asthma and hay fever. "As we have seen with the recent events in Melbourne any serious asthma attack can be life-threatening and have tragic consequences," Dr Jonathan Burdon said. "Act quickly if you start to have symptoms such as shortness of breath or wheezing." During November's freak storm, thousands of people suffering severe asthma attacks flooded hospitals at the same time. Tim Cartwright, who was acting Victoria Police chief commissioner in 2015, will review Ambulance Victoria's response to the storm. "We know there were a number of families who lost loved ones and it is essential we review every aspect of our response so we can learn lessons from events such as this," Ambulance Victoria chief executive Tony Walker said. The results of Mr Cartwright's review will be given to the Inspector General of Emergency Management, who is doing a review of the health system's response to the storm. Meanwhile a teen has been struck by lightning during wild thunderstorms in southeast Queensland. The storms left 35,000 without power. Details of the boy's condition remain unknown but it was reported he was holding a metal door at the front of his house when lightning struck. Nine News reports severeal homes were also struck by lightning, while as many as 35,000 others were left without power. An Energex spokesman confirmed that the Moreton Bay, Somerset Regional and Brisbane City areas were the hardest hit.